MECLABS hosts a regular lecture series to bring new ideas from varied disciplines into the labs to help spark new discoveries in our research team. We're sharing these lectures publicly to help spawn innovative concepts in you as well. Professor Theoharis has taught at UC Berkeley and MIT. Since 1985, Theoharis has taught as an associate professor at Harvard, where he is now an associate professor in the department of comparative literature. All three universities have honored him with their highest undergraduate teaching awards. In addition, he has lectured widely in the United States and Europe, most notably at Oxford. You may be wondering how a humanities professor connects to the research we do at MECLABS. 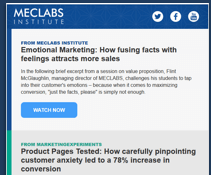 MECLABS is involved in a discovery process that has wider ramifications than marketing itself. Beyond this, there is much to be learned from interdisciplinary thinking. Professor Theoharis is a remarkable scholar who engaged us in two discussions. The first discussion was on James Joyce’s “Eveline” from Dubliners, and the second was on “Ode to a Nightingale” by John Keats. He discussed choice through the framework of classic literature. Choice is at the heart of our research. We recommend you read a copy of James Joyce's short story “Eveline” before watching to gain the most value out of this lecture. We recommend you read a copy of “Ode to a Nightingale” before watching to get the most value out of this lecture. The value proposition is the core of what we do at MECLABS. Michael J. Lanning, who coined the term “value proposition,” visited MECLABS to share his insights on the topic. Over the past couple of decades, the way that customers interact with brands has left more room for the customer to play a role in the development of a company’s value proposition. Recently, Professor Wouter Van Rossum, a leading expert on value proposition and product development, discussed the evolution of a value proposition in a post-Twitter world. "Companies don’t want to hear [feedback]," Van Rossum said. "They don’t like to hear it." However, in a time when customers can ask questions and interact with not only the company, but also with fellow dissatisfied customers online, they demand a more and more personalized experience and influencing, to a point, the overall strategy of the company’s marketing. To remain customer-centric, Van Rossum said that marketers not only need to know who their customers are, but they also must break down the boundary that once separated communication between customers and companies to find "a better way of doing business marketing than simply developing something and then trying to sell it."